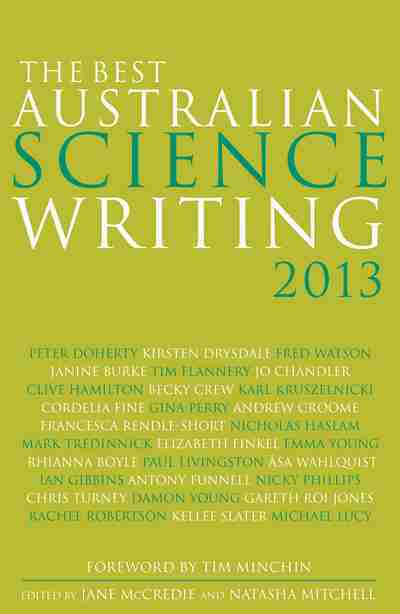 In its pursuit of cool ideas, this diverse anthology – from essays to poetry to memoir – gives a fresh window into what’s happening in the world of science. This collection of essays, by scientists and non-scientists, is a joy for lay-people like me, those of us who Wittgenstein scornfully described as having ‘one of the lowest desires of modern people, namely the superficial curiosity about the latest discoveries of science’ (quoted in Michael Lucy’s essay ‘Higgs boson’). Great science writing is the art of communicating [Douglas Adams’s] ‘awe of understanding’ so that we readers can revel in the beauty of a deeper knowledge of our world … There is no conflict between art and science; there is only the wide-eyed pursuit of cool ideas. The cool ideas discussed in this book range from the possible use of nuclear-powered rockets to shift the Earth’s orbit, through climate change, ritual cannibalism, medical breakthroughs, astronomy and Scott’s ill-fated Antarctic expedition, to a lyrical description by Janine Burke, in ‘Nest: The art of birds’, of the intricate structure of a hummingbird’s nest. Farting also gets a considered mention. The contributors include psychologists, philosophers, neuroscientists, novelists and climate commentators and the pieces are nicely balanced – the professionally scientific essays leavened by snatches of memoir and personal observation as well as the poetry of Ian Gibbins and gareth roi jones. Some themes recur in different ways and from differing points of view, like water usage, climate change, the greenhouse effect, evolution, species extinction and human intervention into the natural world through genetic, bio- and geo- engineering, for good or ill. Some of the ideas discussed are more than surprising: I’m still trying to get my head around the apparently real possibility that chopping down the Siberian and Canadian forests might mitigate against global warming (mentioned in Clive Hamilton’s ‘Earthmasters: Playing God with the climate’). If people were to abandon eating red meat, some grasslands, like the Serengeti, might be repopulated by wild ruminants. But the more likely fate of Australia’s grasslands would be consumption by fire. Essays by Tim Flannery (‘Australia’s endangered future’) and Nicky Phillips (‘Alive as a dodo’) take different aspects of species extinction as their subjects. Flannery mourns the loss of the Christmas Island pipistrelle, a small bat that died out in 2009 – the first example of the extinction of an Australian mammal species in 60 years. He points out that since European settlement around 10 per cent of the continent’s mammal species has disappeared, and describes a new contemporary wave of extinction. Phillips discusses the rather more hopeful possibility of reversing extinction through genome reproduction and cloning, but she warns of the possibility that the environment will have either changed, because of the species disappearing, and therefore no longer be nurturing, or have remained lethal without further interventions. Her ideas reflect back to questions implied in Clive Hamilton’s ‘Earthmasters’: to what extent do humans have the right to intervene in the natural world when they don’t fully understand either how that world actually works or the long-term effects of such intervention? There are shades of Mary Shelley here: people playing god without omniscience. (Or omnipotence. Or infinite mercy …) Other writers take up similar ethical dilemmas – Gina Perry’s ‘Beyond the shock machine’ poses concerns about psychological experiments on humans, and just how far we should be allowed to go in the quest to understand ourselves. Several writers return to Darwin. (Again I’m reminded of Mary Shelley – Darwin’s father Erasmus’s experiments with galvanism partly inspired Frankenstein.) Damon Young, in his think-piece ‘Darwin’s modest discovery’, affirms the 19th-century naturalist’s contemporary relevance; Francesca Rendle-Short uses him as a trope in her moving piece of memoir ‘My father’s body’ to discuss her relationship with her father – now suffering from Alzheimer’s, but once a passionate and published creationist – commenting with wistful irony that both men loved orchids; Nicholas Haslam informs us in ‘On flatulence’ that Darwin was known to fart. A book like this is, of course, a goldmine for writers, providing accessible descriptions of contemporary research, as well as futuristic-sounding technologies, in a range of modes, including a contribution that might be of great interest to crime writers – Kellie Slater’s ‘How a donor is done’, a piece reminiscent of the forensic preoccupations of Patricia Cornwell and Kathy Reichs and which gives fascinating detail about organ harvesting. It’s impossible to cover everything in this eclectic anthology – there is so much that is fascinating, scary, moving, humorous and educational to provoke the imagination. For example, whether Pluto is a planet or not, and if not, what is it? Or whether autism might be inherited from maths-geek grandparents, and if that matters. Not to mention intersex trout; changing sexual and gender roles in humans; data-mining; how chooks help us combat viral disease; the paradoxes of energy-efficiency; our second brain (in our gut) and the revival of Mt Stromlo after the 2003 fire. And that’s by no means all. This is a book teeming with questions and ideas, a book that leaves the reader feeling emotionally and intellectually stimulated as well as up-to-date and well-informed on many issues, Wittgenstein notwithstanding.